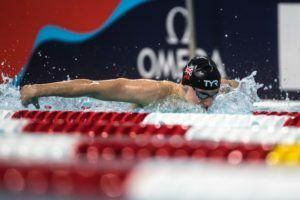 Several notable athletes took to the Piscina Samuele water tonight in Milan participating in this year’s edition of the Trofeo Citta Di Milano. 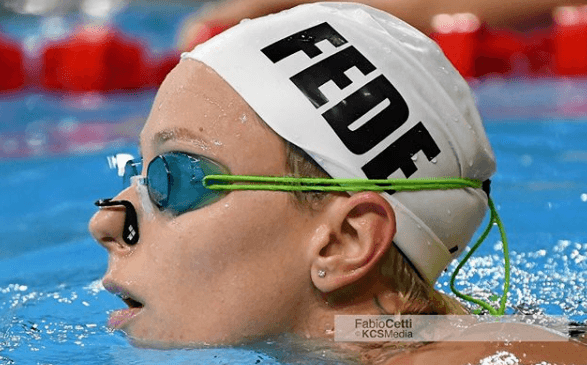 Eyes set on the pool as World champion and multiple Olympic medalist Federica Pellegrini won the women’s 200m freestyle with ease, clocking a golden time of 1:57.18. That’s a solid mark for the Italian who holds the World Record with her 1:52.98 from 2009. She took the world title again in 2017, producing a time of 1:54.73 to outdo America’s Katie Ledecky. Her outing this evening in Milan falls in line with the rest of the elite world, inserting itself as the 3rd fastest effort thus far this season. Only Ledecky (1:55.32) and China’s Wang Jianjiahe (1:56.70) have been faster. The men’s 200m free race saw the top 3 men all notch times under the 1:50 barrier, led by home nation swimmer Stefano Ballo. Ballo touched the wall in 1:49.5, with Matteo Campi narrowly finished behind by just .13 in 1:49.69. Alessandro Miressi, the reigning 100m freestyle European Champion, rounded out the top 3 in 1:49.93, the 3rd fastest time of the 20-year-old’s career. Also in the men’s 200m race was Hungarian legend Laszlo Cseh, who finished in 11th with 1:51.80 for a nice warm-up swim, while Hungary’s Daniel Dudas settled for 16th in 1:52.53. South African Chad Le Clos was entered in the race, as was Italy’s Gabrielle Detti, but both wound up no-showing. Instead, Le Clos focused on his head-to-head battle with the aforementioned Cseh in the 200m butterfly race. Opening in a speedy 54.53 for the first 100 meters, Le Clos faded a bit to where Cseh took control of the back-half of the race to finish well ahead in 1:56.60. Le Clos clocked 1:57.23 in the two-man race. Both times check-in as the swimmers’ season-bests, with Cseh’s mark entering the world ranks at #8, while Le Clos now sits as the 11th fastest performer in the world. Youth Olympic Games multi-medalist Thomas Ceccon was also in the men’s 200m fly race, finishing in 2:03.70 for 7th. Iron Lady Katinka Hosszu of Hungary snagged the women’s 200m fly title in the only time of the field under 2:10. Hosszu clocked 2:09.09 to nab her fastest of the season and land among the top 6 performers in the world this season. Hosszu also easily took the women’s 200m backstroke title, beating the field by over 2 seconds. 2:12.48 is the time Hosszu captured for gold, another season-best for the Hungarian. She was back in the pool for the 200m breaststroke tonight as well, but cooled down with a 2:37.67 for 13th overall. Winning the women’s 200m breast was Francesca Fangio, who registered a new meet record en route to topping the podium. Fangio earned a winning time of 2:25.67 to crush the previous competition record of 2:28.30 set by Elisa Celli back in 2013. Fangio’s time tonight represents swimmers’ personal best, slicing over half a second off of her previous career-fastest of 2:26.40 from last year. Luca Pizzini was tonight’s 200m breaststroke winner for the men, hitting the wall in 2:14.32, while Italy’s golden girl of distance, Simona Quadarella, took the women’s 800m free in 8:35.10. Both Detti and Gregorio Patlrinieri were slated to swim the men’s 1500m, but were not in the pool today. Flavio Mantegazza got the job done in the race instead, producing a wining time of 16:03.35.